Musheer Hussain, Edward Fisher, Jonathan Fishman,	The Journal of Laryngology & Otology, Volume 132 Issue 6, p 469. Z-C Lou, Z-H Lou, J Xiao,	The Journal of Laryngology & Otology, Volume 132 Issue 6, pp 470-478. G J Watson, M da Cruz,	The Journal of Laryngology & Otology, Volume 132 Issue 6, pp 479-485. 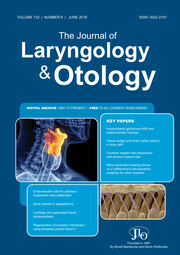 F N Ardiç, K Aykal, F Tümkaya, C O Kara, F Barlay,	The Journal of Laryngology & Otology, Volume 132 Issue 6, pp 486-488. N Jufas, A Rubini, D Soloperto, M Alnoury, M Tarabichi, D Marchioni, N Patel,	The Journal of Laryngology & Otology, Volume 132 Issue 6, pp 489-492. C P Yiannakis, R Sproat, A Iyer,	The Journal of Laryngology & Otology, Volume 132 Issue 6, pp 493-496. A A Kolethekkat, R Al Abri, K Al Zaabi, N Al Marhoobi, S Jose, S Pillai, J Mathew,	The Journal of Laryngology & Otology, Volume 132 Issue 6, pp 497-504. Is the use of a bone conduction hearing device on a softband a useful tool in the pre-operative assessment of suitability for other hearing implants? P M Spielmann, R Roplekar, C Rae, F Ahmed, S E M Jones,	The Journal of Laryngology & Otology, Volume 132 Issue 6, pp 505-508. D E M El-Hennawi, M R Ahmed, A S Abou-Halawa, M A Al-Hamtary,	The Journal of Laryngology & Otology, Volume 132 Issue 6, pp 509-513. J Hertz, C Siim,	The Journal of Laryngology & Otology, Volume 132 Issue 6, pp 514-518. C K Youn, Y Jun, E-R Jo, S-J Jang, H Song, S I Cho,	The Journal of Laryngology & Otology, Volume 132 Issue 6, pp 519-522. D Demir, M S Yılmaz, M Güven, A Kara, H Elden, Ü Erkorkmaz,	The Journal of Laryngology & Otology, Volume 132 Issue 6, pp 523-528. H Kanona, K Stephenson, F D'Arco, K Rajput, L Cochrane, C Jephson,	The Journal of Laryngology & Otology, Volume 132 Issue 6, pp 529-533. A E Pamuk, G Pamuk, S Jafarov, M D Bajin, S Saraç, L Sennaroğlu,	The Journal of Laryngology & Otology, Volume 132 Issue 6, pp 534-539. S Sharma, M Grover, S N Singh, T Kataria, R S Lakhawat,	The Journal of Laryngology & Otology, Volume 132 Issue 6, pp 540-543. E H Stefanescu, S Motoi,	The Journal of Laryngology & Otology, Volume 132 Issue 6, pp 544-549. P A Dimitriadis, M Saad, M S Igra, R Mandavia, C Bowes, N Hoggard, J Ray,	The Journal of Laryngology & Otology, Volume 132 Issue 6, pp 550-553. D Lobo, M Tuñón, I Villarreal, B Brea, J R García-Berrocal,	The Journal of Laryngology & Otology, Volume 132 Issue 6, pp 554-559. T C Biggs, N Jayakody, K Best, E V King,	The Journal of Laryngology & Otology, Volume 132 Issue 6, pp 560-563. K Jolly, A Darr, S V Chavda, S K Ahmed,	The Journal of Laryngology & Otology, Volume 132 Issue 6, pp 564-566. The Journal of Laryngology & Otology, Volume 132 Issue 6, pp -.